Bachmann Jackson Sharpe Coach re-branding. Having collected together almost all the bits to re-assemble these, I wanted to make a start in earnest. The big trouble is that as usual Earnest is nowhere to be found! All the masking tape has been removed and a start to refitting the glazing made. I thought; next stage, screw the floors back in. This is the first point where I could have come unstuck. By good chance/luck/happenstance I happened to think that the easiest to get near completion was the Baggage car. Having selected and inspected the floor I took the first chassis available and was about to start fitting screws when I realised that there were too few holes. 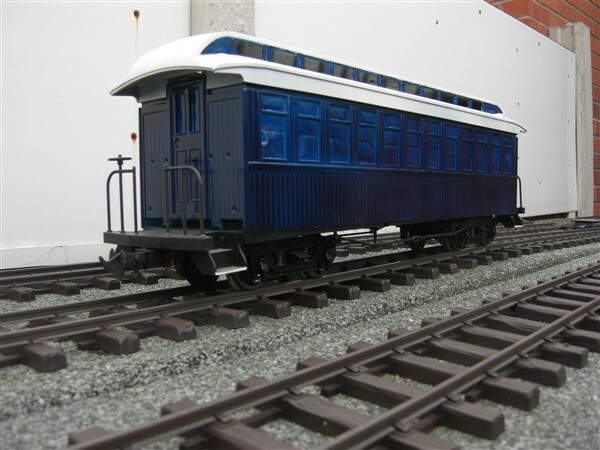 It seems after a look at all the others that the Baggage Car chassis has more screw-holes than the rest. I'd have absolutely hated to get several coaches all screwed together before finding that out. 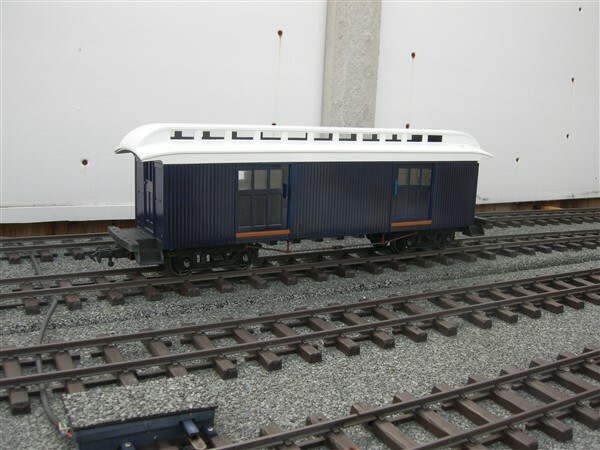 For the uninitiated, what is a Jackson Sharpe Coach, is it a Bachmann brand or prototype type. Jackson Sharpe were one of the big US carriage builders in the early days, and also built narrow gauge coaches. As a slight digression, and in case anyone else has the same question, the Jackson & Sharpe photo collection is in the Delaware (State) Public Archive. 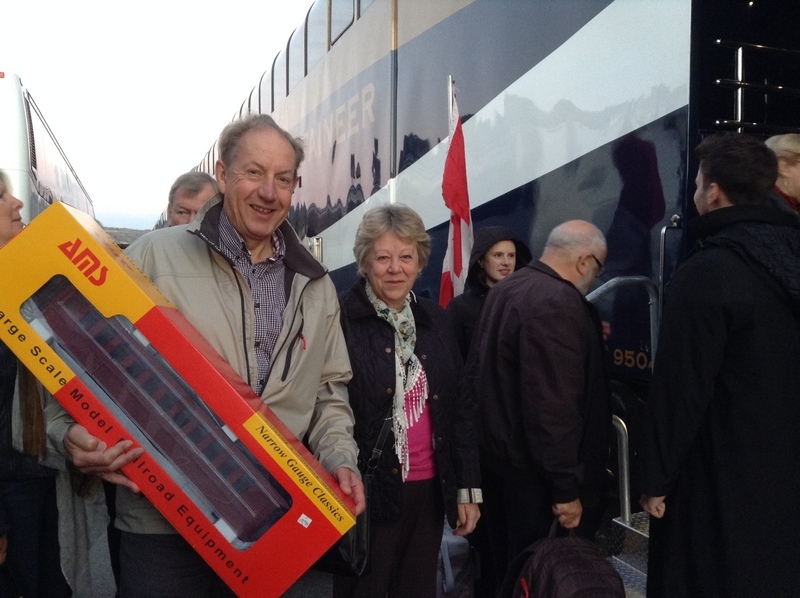 The Bachmann coach is considerably compressed [so you have to compress the passenger's feet to get them in.] Accucraft makes a similar coach in 1:20.3 which is almost twice as long. The Bachmann coach is considerably compressed [so you have to compress the passenger's feet to get them in. They've got considerably fewer windows as well (Thank goodness! ! ! ! !). 17 - 12! Accucraft makes a similar coach in 1:20.3 which is almost twice as long. And about 3 times the price, certainly this side of the puddle. If and when you can get them. Now that will look *really* silly on a R1 curve! It would, but it won't come to that - it does struggle on R3 though, or even Aristo's truer 8ft curves (I still have a circle of 8ft curves dotted around the garden). Hey, I have one converted to a 44' 15 window version that has an extra window insterted in the side! Try getting that around R3s. Anyway, it has several people in it (segue back to the original thread,) that didn't have to have a foot amputation. However, it is tough to get a 1:20.3 person in the seats. Did you strip off the original paint or just prime straight over it? If stripped what did you use? I have 3 bright yellow ones that just have to be painted something more realistic for my railway theme. Think I will do the strip and put each cars parts in a separate marked bag (eg combine, coach, observation) that stays with the car as it goes through the reno process. Beauty thing is, these cars, well the coach and baggage, are dead ringers for some that ran here in NZ. I had two yellow ones as well! I stripped them down and put the parts into the dishwasher, then all I did was give them a light but thorough rub down with 600 grit W&D. The plastic primer seemed to be well adhered so I'm not expecting problems, but only time will tell. I did put most small parts in tubs, but there's always something that get moved or left out when a project takes this long. 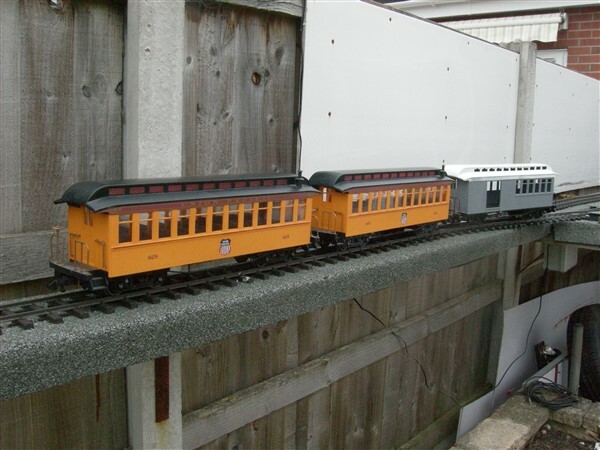 The baggage car had previously been repainted (not very well), that took a bit more care, but looks fine. Transfers I just rubbed off with the W&D. This saga continues, but I'm having trouble with the glazing. Some were originally stuck in with something softish/flexible, but not a silicon, somewhat harder than that, some with what looked like hot-glue, and some was a bit like Liquid-Poly, and some just clipped in. Having been advised that silicon would hold, that was the route I took but unfortunately some of it didn't: take, that is. I would advise folks not to mix glazing panels around your fleet. These coaches whilst they may all look the same, are not! There are minor differences that seem to pop up occasionally to bite one. I seem to have at least three incarnations amongst my six. Having got to over half-way through the build-up I wasn't about to start stripping down again and test which panels fitted best in which body, so I had to do small mods to what I had. It took time to get it right. The problems were two-fold, the hooks at the top, and the actual fit of the glazing bars into the window moulding. The first was relatively easy as the edge of the glazing can be slimmed with a file to suit the hooks and allow it to sit as close as possible to the body side, the second, almost impossible, so I made do with cleaning the edges off the glazing bars. It all seemed to help. We now await more silicon drying (which I'm leaving, clamped, for a day). 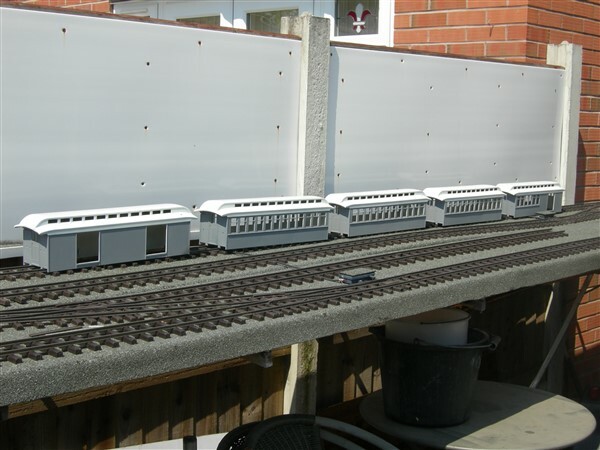 I am considering a "re-vamp" of my Bachmann coaches, it would seem the glazing is fixed in position, do people remove the glazing before spraying or just mask? I took mine out Jim. I used one of the long snap-off blades which I removed from a craft knife in the Poundland 6 pack and carefully worked it down towards the coach floor to separate the glazing from the body. If you do it slowly and gently, it won't break (I know from experience). Mike, many thanks I will give it ago (but not today). I removed my glazing from the bottom up! One type just has plastic 'trimmings' that clip either side of the body mounting lugs. They also will just prize out, carefully, just take your time. After cleaning and rubbing down, I sprayed inside and out with plastic primer, then sprayed the insides off white/cream, then masked straight across the insides of the windows to spray the outsides. I also painted the window frames before removing the masking tape. does the roof come off, I have removed the six screws but it will not budge, is it glued as well, or could just be the previous owner paint? Yes Jim, the roof does come off. By 'removed the 6 screws' I assume you mean those on the ceiling of the bodyshell which are revealed once the chassis and floor have been taken off. Further to G-force1's post above, he's right. My old age showing with memory defect - you tackle from the bottom.